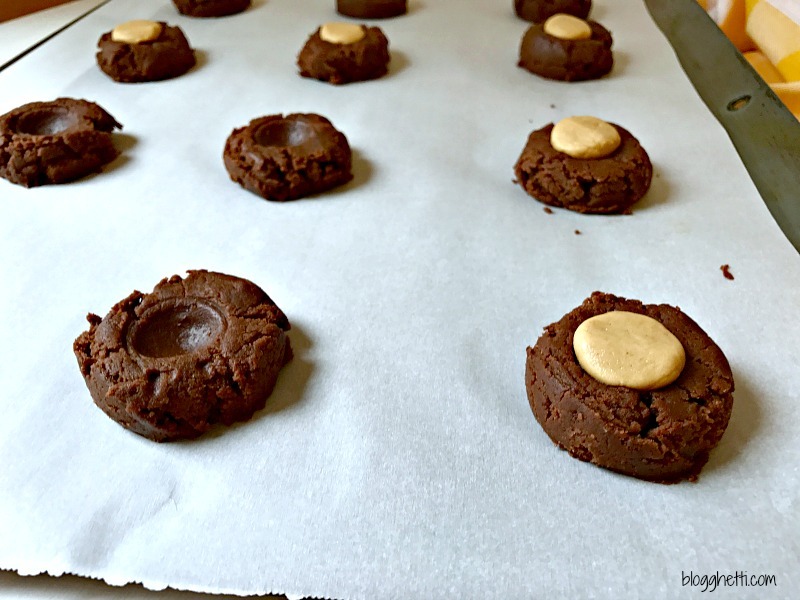 Buckeye Thumbprint Cookies are a rich chocolate cookie with a peanut butter filling in the center. To make the cookie even more decadent, it’s topped with a drizzle of melted chocolate. It’s a chocolate-peanut butter lover’s heaven. I’m just getting started with this new cookie cookbook – Easy Homemade Cookie Cookbook written by Miranda Couse, the blogger behind Cookie Dough and Oven Mitt. This cookbook has 150 cookies and bars for any occasion or craving. There’s drop cookies, cut-outs, shortbread, whoopie pies, brownies and bars. Where to start?!?! 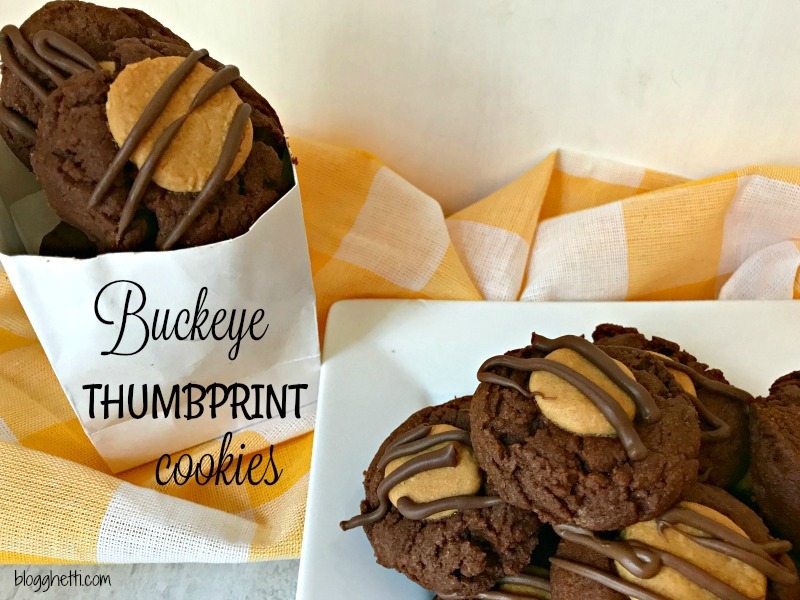 I started with these Buckeye Thumbprint Cookies as the combination of chocolate and peanut butter is one of my favorites. But I can’t wait to make Hermit Cookies, Creamsicle Drops, Red Velvet Cream Cheese Whoopie Pies, and so many more. This year’s recipients of my annual baking frenzy are either going to love me or hate me – cookies = yum or cookies = weight gain! Ha! In my review (and drooling) of this easy-to-read cookbook, I discovered that if I had a question about the recipe, Miranda had already anticipated it and gave me the answer. I like that! No guessing or Googling needed. The book is filled with baking tips to get that perfect cookie, suggested kitchen items needed, and ways to change the recipes for another twist on the same cookie. This will be one cookbook that will be like my Better Homes and Gardens Cookbook – well read and used with stains on the pages! That’s cookbook love! Have I tempted you? 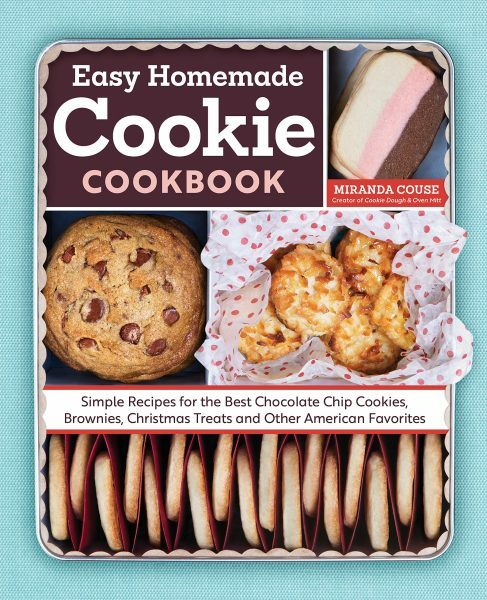 You can pre-order the Miranda’s cookie cookbook on Amazon by clicking through here. Now, on with the cookie recipe! If you have never heard of a “buckeye”; let me tell you what it is. It’s a nut tree and the official tree of the state of Ohio and the name of Ohio State’s football team. More importantly, it’s the name of a candy confection of peanut butter fudge dipped in chocolate. Delicious! The recipe is super easy – I promise! I always start by mixing my dry ingredients in a separate bowl, then moving on to the wet ingredients in another bowl. With this recipe, I started with mixing up the peanut butter filling in a small bowl, setting that aside and then on with the dry and wet. The base of the Buckeye Thumbprint Cookie is a rich chocolate cookie with the texture that of a shortbread cookie. By that I mean, it’s crisp on the outside and melt-in-your-mouth delicious on the inside. The center is the peanut butter-confectioner’s sugar mixture and when baked into the chocolate base – well, it’s just heavenly. Once you remove the cookies from the oven, be sure to let them set on the pan to cool a few minutes as the cookies need to set up otherwise they will fall apart. In my family we tend to call those broken cookies “testers”. Sometimes it seems I have more testers than cookies to put in the cookie jar. I think they purposely break them….just sayin’. Details for the giveaway are below the recipe. Giveaway has ended and the winner is Stacie F. Congrats! 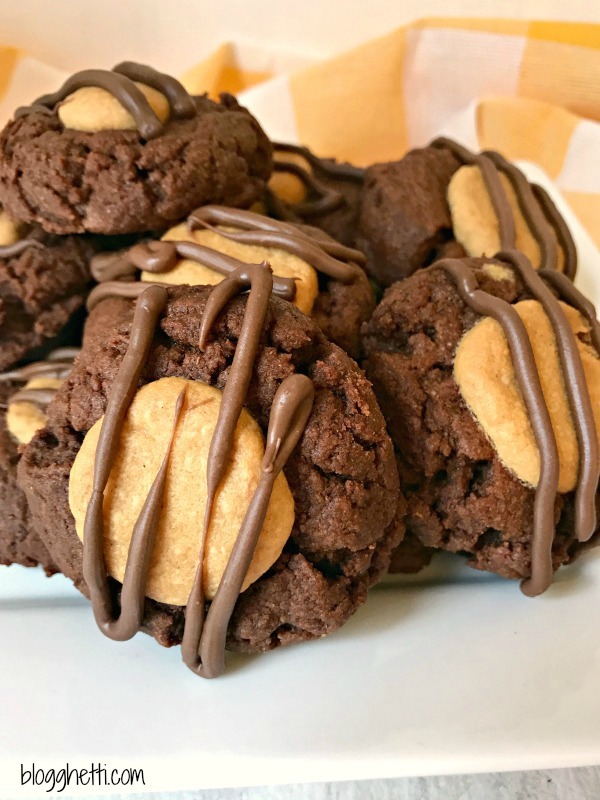 Buckeye Thumbprint Cookies are a rich chocolate cookie with a peanut butter filling in the center. To make the cookie even more decadent, it's topped with a drizzle of melted chocolate. It's a chocolate-peanut butter lover's heaven. First make the peanut butter filling: In a small bowl, mix the peanut butter, icing sugar and vanilla essence until smooth and set aside. Preheat the oven to 350 degrees. Line a baking tray with parchment paper. In a medium mixing bowl, sift or whisk together the flour, salt, and cocoa powder. Set aside. and creamy. This will take around about 3 minutes. Add in the egg yolk and vanilla extract -beat to combine. Then add the dry ingredients (a little at a time) and beat on low speed or by hand until the dough comes together. Using 1 ½ tablespoon cookie scoop, scoop the dough into balls and drop them 2 inches apart on the prepared cookie sheet. Flatten the cookies slightly. Using the back of a ½ teaspoon, create an indentation in the center of each cookie – or use your thumb to create this “thumbprint”. Scoop out 1 teaspoon of the peanut butter mixture and roll it into a ball. Press into the indentation in the center of each cookie. Repeat with the remaining cookies. Bake for 15 to 16 minutes, until the edges are firm to the touch. bag. Once the cookies have cooled completely, drizzle them with the melted chocolate. Crunchy peanut butter can be used in place of the creamy peanut butter. My favorite cookie recipe is Lemon Bars. Mainly because we have 2 prolific lemon trees, but really they are the BEST! My favorite cookies are lemon tea cookies followed closely by shortbread. Yum! Those look so delicious! I am pretty simple, my favorite cookies are definitely a homemade macadamia nut cookie! I love a good, soft snickerdoodle cookie….right from the oven! My favorite cookie recipe is the Snickerdoodle recipe. Peanut Butter Kiss is my favorite cookie recipe. Perfectly balanced with salt and sweet and delightfully buttery! I love Santa’s Whiskers… BTW, I can never get my comment to post!! I unclicked comment luv, even though I have it downloaded in my computer. Maybe this time will work?? Thank you!!!! I love chocolate chip cookies so I try many different recipes for this. My favourite cookie recipe is Chocolate Shortbread. I like a good shortbread cookie. I love the good old fashion Nestle chocolate chip cookie recipe!